I had three of the QD version wet side magnet popped out and no longer working. Never had this issue with the older models? I have been using Ecotech power heads over the last 9 years and it seems like quality has gone down over the past 2-3 years. Anyone have this issue or it is just me? SPS Dominated. Miracles 270g starphire C2C external overflow, BK200, ATI PM, Georeef KR618, CR618 with CarbonDoser Co2, Apex, WXM, PM2, Auto feeder. I've heard it happening to other people too. I bought a new wet side recently. I guess I'll be needing to check it regularly! It's an MP10 though and I think the other issues I've seen have been with MP40s. I'm not sure why they needed to fix something that wasn't broke. The old wet side were just fine IMO. I had it happen to one of my QDs. Ecotech swapped it out free of charge. Luckily I had a backup wetside so didn't suffer any down time. I check my magnets with every cleaning now (every 4 months or less). OMG! I lost 70% of my SPS last April and could not figure it out. Anyway, about 10 months ago I noticed the wet side keeps falling off every time I turn on the MP, but I did not know that the magnet popped and could not spin. Some colonies I had for 8 years started to stn, which I find weird because I know they are hardy. Anyway, now I noticed two more QD are doing the same. FYI, two of my 6 years old tunze are still running fine with little maintenance. I called Ecotech and asked them about the quality and if anyone have complained about the rusted wet side. They told me no, and since my wet side is over 1 year they will not honour the warranty. I am ok with that, but if I spent $500 for a pump, I would expect it to last more than 2 years. I owned about 8 MPs and have always recommended them to local reefers. I'm very disappointed in the quality. I think I will be switching to Tunze from now one. One wet side goes bad I can take, but when all three newer QD wet side goes bad. I think Ecotech need to do a better job and back up their products. Found the same thing this week, ET said they will replace it and my pump is almost 3yrs old. Very disappointing for a “premium” product, but so far customer service has been good. Mine is newer than yours but they won’t replace. I guess it depends on which tech you deal with. The tech I was dealing with doesn’t care too much about my issue. I helped a lot people setting new tanks and have always recommended Neptune and Ecotech. Too bad I can’t say good things about Ecotech any more. Just saw this on FB. Another person facing the same issue. This is a common problem with these pumps. A previous post from Ecotech defended that the number of magnets that swell are well within acceptable limits and don't have plans to do anything except replace the ones that fall under warranty. It's the nature of the beast, if the plastic that seals the magnet allows any salt water to touch it, it's only a matter of time before this happens. I have no idea whether it's a common problem; nor do you. It certainly appears to have been an issue for the early QD models. I own three MP40 QD models, all bought when they first came out (3 years? lost track), and all have been fine, so those are my 'data points'. Seems ETM is pretty good about replacing them, at least if you live in the US. FWIW, swelling/split impeller magnets is something we all should be regularly checking for. I'm on my third one for my old sedra pump. another one failed today. Just my luck. Will call Ecotech tomorrow and see what they can do. Unfortunately, after I exhausted my search, Tim must have petitioned to have that entire thread removed because I can't find it anymore, it's lost in the mod section now. We will have to agree to disagree. Paraphrased, it stated that the majority of people that report (on forums) the negative about a product versus the positive will always outshine, and through their research the number of magnets that split are far lower than whatever threshold they set for this problem. In my hobby experience, I have owned 15 separate pumps and out of those, 3 have had split magnets. That's 1/5 or 20%. I might also add that they were all mp40s, in my hobby experience I have owned 7 (out of the 15) mp40s, meaning 3/7 or 43% of them had split magnets. I'm not saying that these are hard numbers that ecotech has as well, a more accurate picture can easily be painted with their reported numbers. However, I would also consider how many people out there aren't even aware that their magnet has split and goes unreported. From a business aspect I understand their position, from a consumer stand point, this should be a non issue, no one should experience this problem. And that's the frustration that many of these guys are having. Fair enough. It would actually be interesting if folks would publish their numbers as you have done. In my case, I've owned 14 vortech pumps - 6 old style MP40 (only have one left), 3 new style QD MP40, 2 MP60 and 3 MP10. I inspect and clean the wetsides every other month. I dropped one of the old MP40, oops, and sold off four. None had split or rusted magnets. I replaced the remaining old style MP40 wetside last year after 5 years of use, no split but it had developed an unfixable wobble. Two MP60s are three years old and on their original wetsides, no splits. One MP10 got water in the dryside so kaput; other two are QD models and no splits. Maybe I'm just lucky. They've known about it for a long, long time, and it is definitely not a rare issue. Search for "rust" in this forum. I'm not sure how "common" it is, but it's happened with all of my MP10's (4 of them) and 1 MP40 but not the other MP40, so that's 83%. It affects the new QD ones as well, and the people I know who have never had rusted MP pumps are by far in the minority. At best it can be described as not uncommon, and it happens so regularly that my opinion is if you have 4 MP pumps and they go 4 years without any signs of rust then you are extremely fortunate. 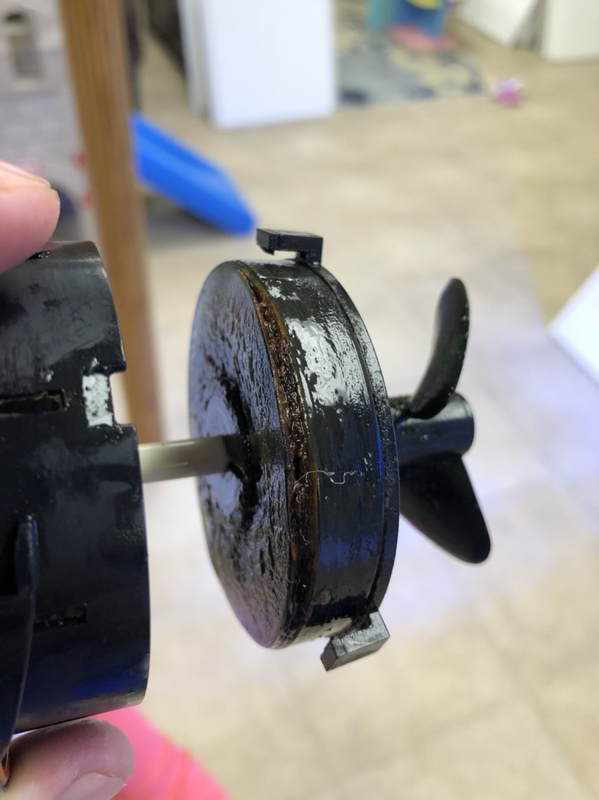 Whenever anyone I know has mystery SPS issues I tell them to check their MP pumps, at least 25% of the time they have rusted MP pumps and the issue goes away after they're replaced. Should send your water sample for ICP analysis for unwanted heavy metal like Tin.